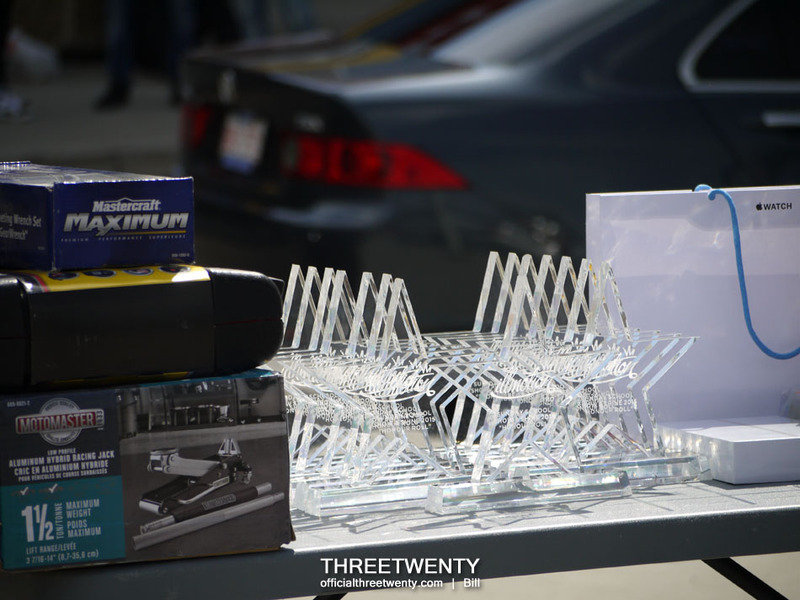 Part 4 today will be my final show coverage before getting to the group of cars representing ThreeTwenty, which as promised will conclude this series of posts. Before I begin with the photos today though, I want to share the amazing news that the 2015 edition of Sunday School set a record for the amount of money raised! All said and done, $5500 will be going to the Calgary Humane Society! 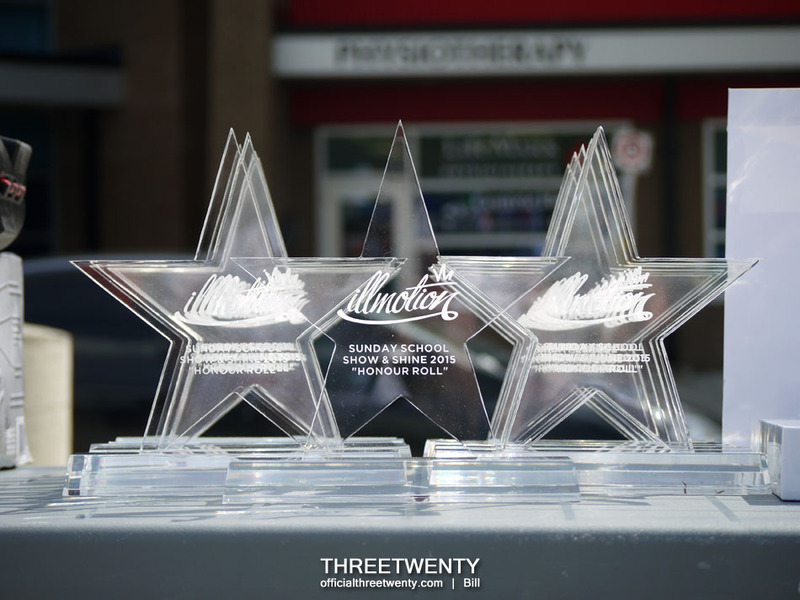 Great weather, great cars, and all of it benefits the Humane Society in the end. Well done everyone! Today’s post starts off with the red on red WRX from Legit.Society. Every time I see someone with white lettering on their tires, I wonder if I should give it a try. Also from Legit.Society was the black and white Camaro, which has made the trek out to Sunday School before. I don’t know if it’s static or not but for the sake of the splitter I hope it has bags. Haha. 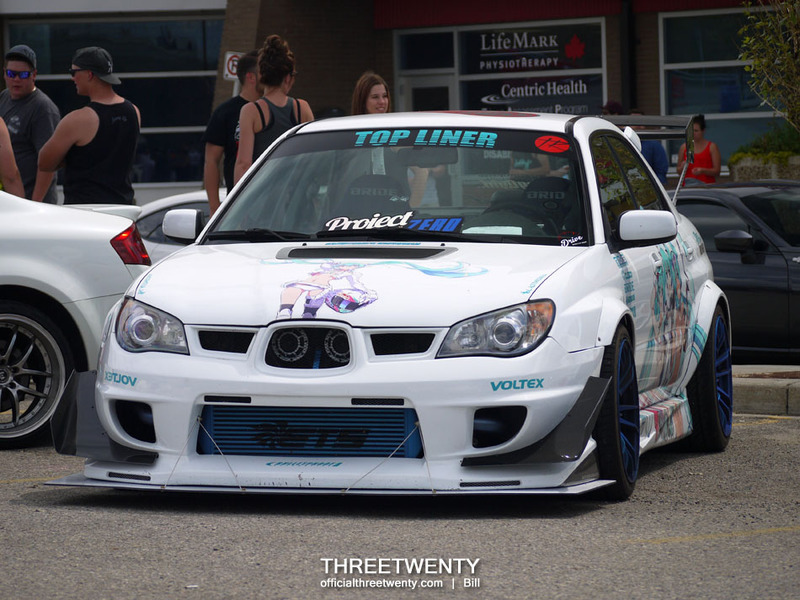 This IS300 was pretty tidy. 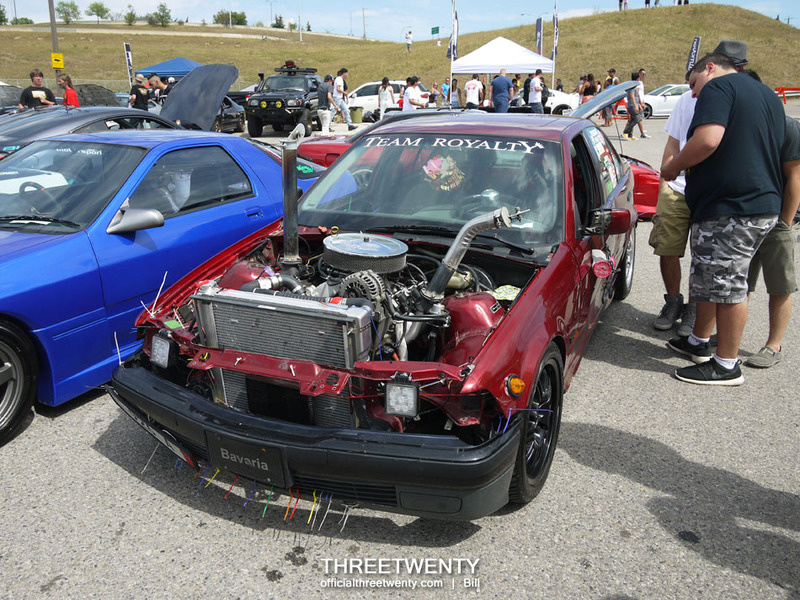 A nice R32 with some seriously wide rear overfenders. I like that the headlights have blue housings to match the engine bay. Next to that was a winking RX7 which also had some blue accents. If you look closer you’ll notice the lack of a rotary too. 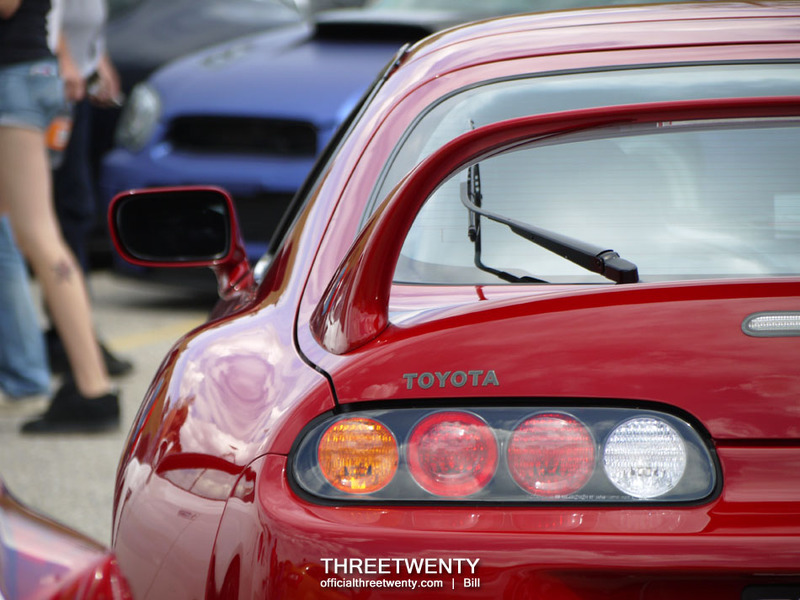 My personal favourite of the trio was probably the Supra though. Boost had me like “I want that”. With these three iconic Japanese sports cars together, all in white, I had to get a shot of the trio. In fact, I also have one taken from the back, up on ill.motion. It was too good of an opportunity to pass up. I’ve been following the progress on Josh’s FR-S and it’s coming along nicely. The ARC intake is probably my favourite part on it as I’ve always really liked them. Check out the Valenti headlights too. 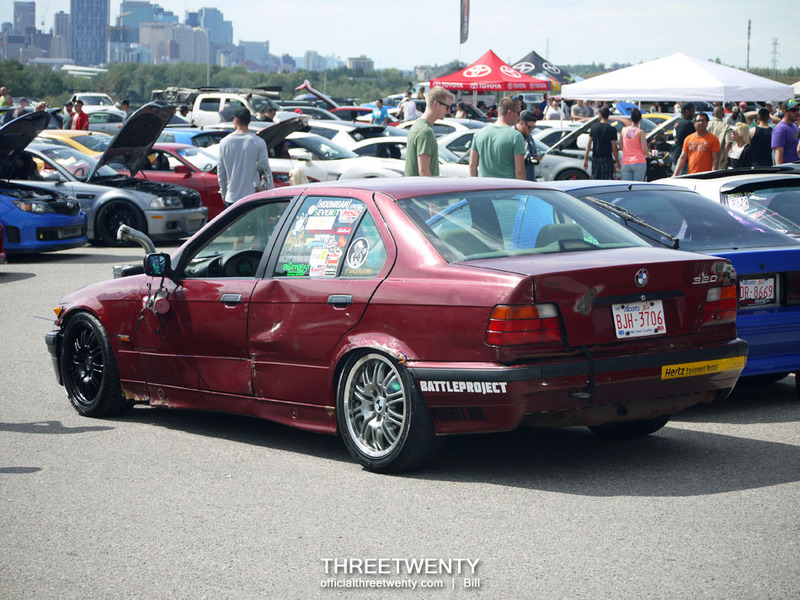 I first ran into this old 3 series at the Edmonton season opener this year, but unfortunately my photos of it didn’t turn out all that well since it was getting dark when I took them. When I stumbled across it at Sunday School I made sure I took a couple to make up for that. 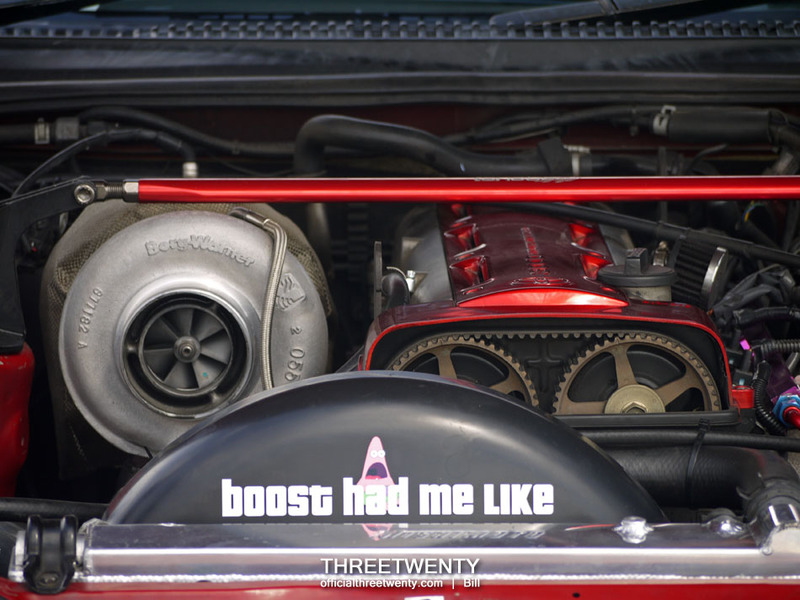 Hoodless, V8 swapped, roughly a million tree air fresheners and zipties, and more. I could see it being a lot of fun to mess around with though. This really clean S15 was next to the pair of silver R34s seen earlier in the coverage (part 2 for those wondering). 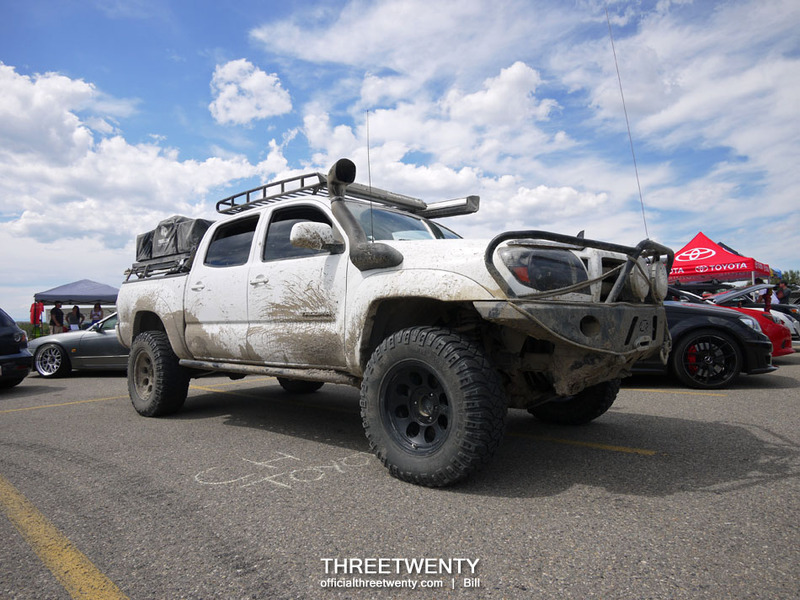 Bringing a lifted truck to a show that will primarily consist of lowered cars? Stand out more by running it through mud first! Haha. This made sense though. This ‘look’ kind of suits the truck more, I think. Definitely one of the loudest vehicles at the show – possibly THE loudest – was this G35 which showed up a little later and was part of the Haute AG group. This really turned a lot of heads upon its arrival as people tried to figure out where the racket was coming from. 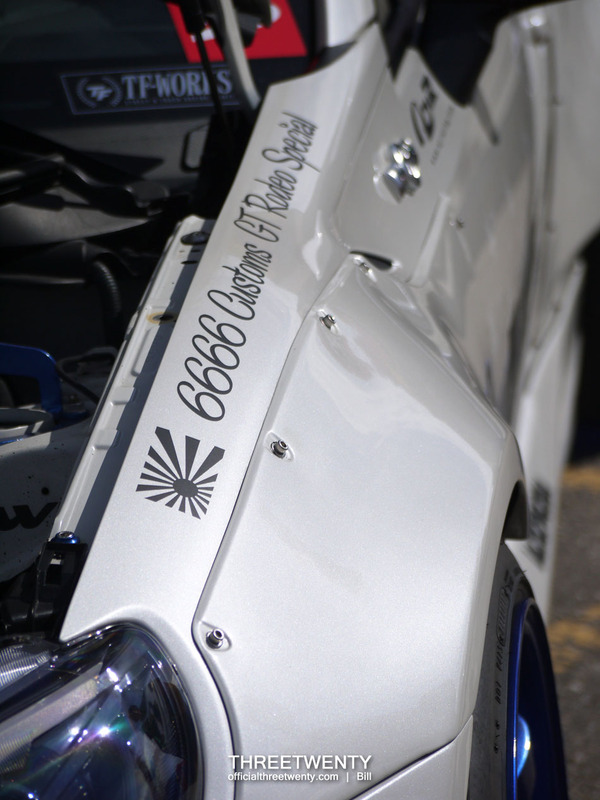 Since I was walking around with my telephoto on I decided to grab a few more shots of the cars from Vancouver. These were among my favourite vehicles at the show because of the number of high-end parts they had and their overall style. 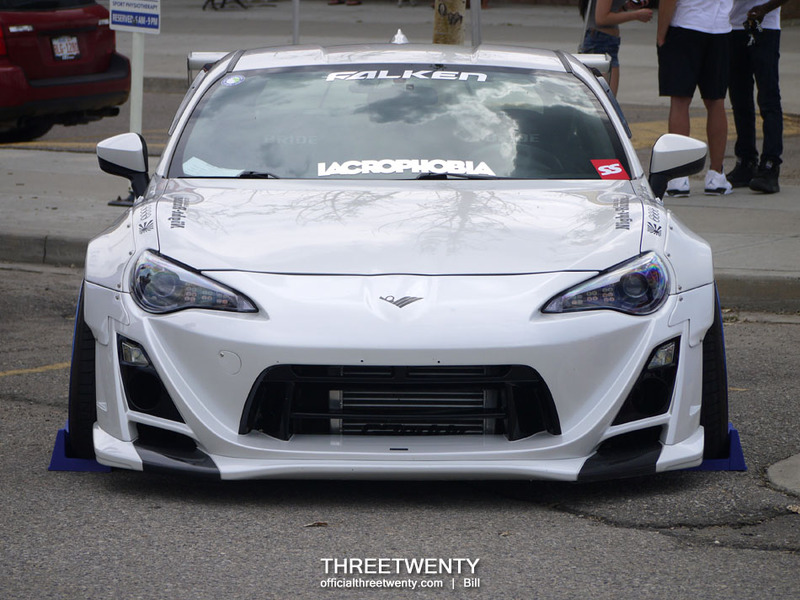 Reggie’s FR-S has a small intercooler peeking out from behind the Varis bumper now that it’s turbocharged. 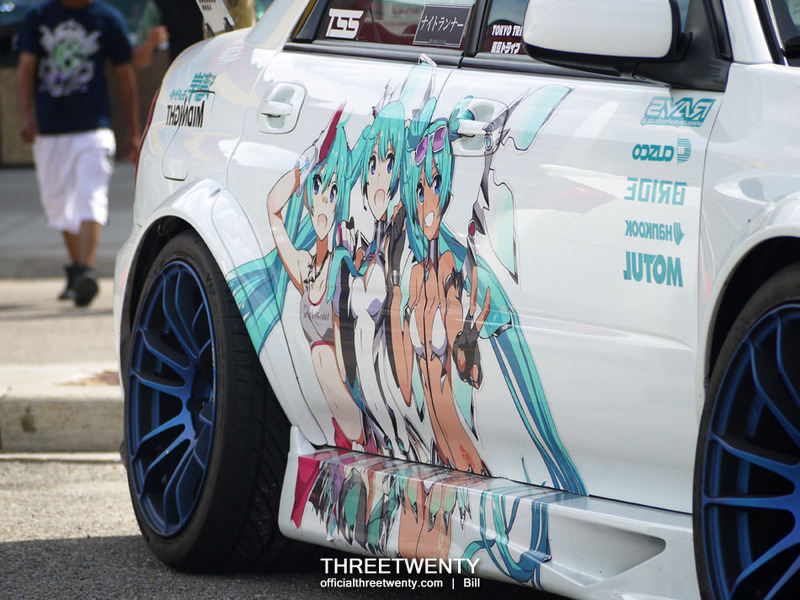 The colour-coded Voltex wing on this BRZ was a nice touch. Overall, this whole car looks – to me – like something that Subaru would offer as a more track day-focused version of the BRZ. Cooper was out for a walk around the venue and came by our tents so I was able to grab this snapshot. Such a cute little guy! This Spoon S2000, which was at Jackie’s BBQ, wasn’t even part of the show. 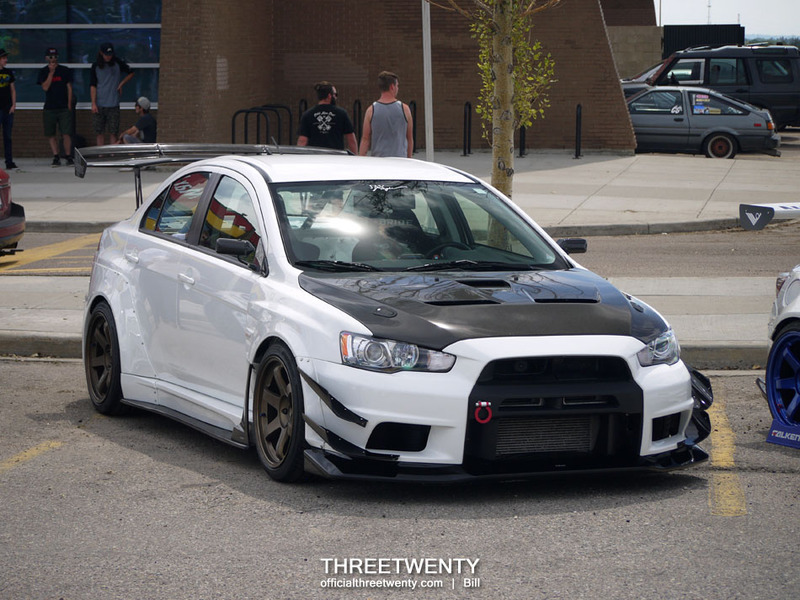 I wandered up to the parking lot with Scott to check out his Evo’s new exhaust (which is crazy loud by the way) and naturally it was filled with a number of modified vehicles – this just happened to be right next to him so I took the photo. Since I still have a couple of Rocket Bunny FR-S model kits on my workbench I made sure to grab lots of shots of Reggie’s car. Nothing beats seeing a car in person for making notes and getting reference material. 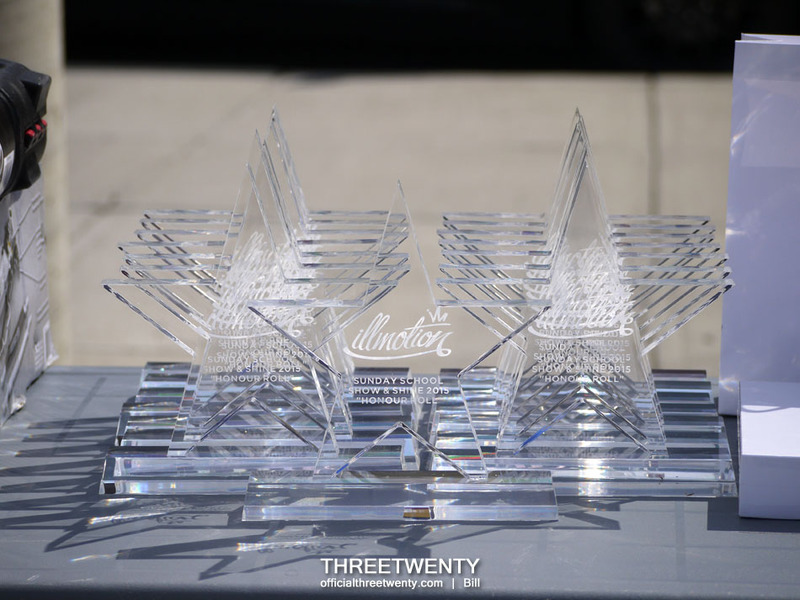 Like last year, for this show ThreeTwenty sponsored the Honour Roll trophies and I was extremely impressed by them; this was the first time I had seen them in person and they were truly beautiful. I’m thankful for having the opportunity once again to sponsor these and was proud to be able to help out with the show. Now there’s just one part of the coverage left, with our own group. After the show ended a few of us stuck around to take some photos in the empty lot so I’ll be putting together a small post with some of those as well for later on. Hopefully you all have enjoyed the coverage thus far! And lastly, before signing off today, I want to offer the reminder that there’s a Grey Eagle meet tonight! They had been canceled the last couple of weeks as the casino needed the parking lot for events but now they can offer us the room again. Tonight’s is also the second-last official GE meet of the year (yes, already!) so I will definitely be there to partake. Some of us are planning on a Focus meet at next week’s while we still have the chance to go, and are hoping we can get a number of Foci out for that.